, bishop of Winchester, was the son of Robert White, of Farnham in Surrey, and was born there in 1511. He was educated at Winchester school, and thence removed to New college, Oxford, of which he became perpetual fellow in 1527. In 1534 he completed his degrees in arts, and being esteemed for his classical knowledge, was about that time appointed master of Winchester school. He was soon after made warden of Winchester college, and appears to have been principally | instrumental in saving it, when the adjoining college of St. Elizabeth, the site of which he purchased, and so many others, were utterly destroyed. He was in 1551 promoted to the rectory of Cheyton in that neighbourhood; but in the preceding year, being suspected of corresponding with persons abroad, who opposed king Edward’s proceedings, he was examined by the council, and committed to the tower. After continuing some months in confinement, he pretended compliance with the reformed religion, and was set at liberty. 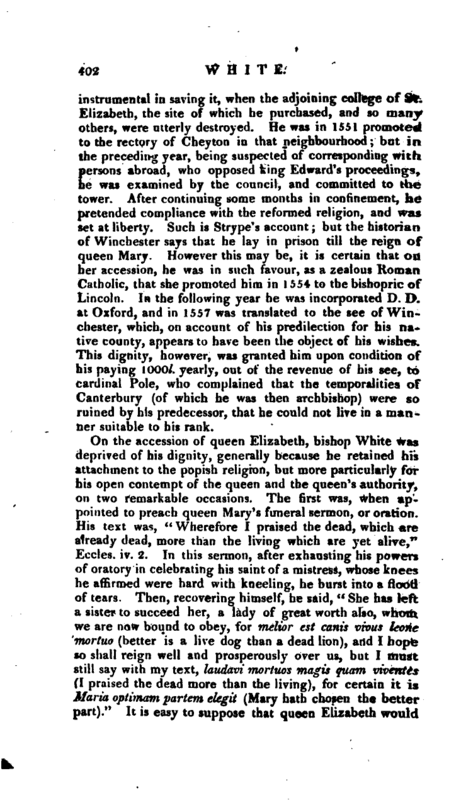 Such is Strype’s account; but the historian of Winchester says that he lay in prison till the reign of queen Mary. However this may be, it is certain that on her accession, he was in such favour, as a zealous Roman Catholic, that she promoted him in 1554 to the bishopric of Lincoln. In the following year he was incorporated D. D. at Oxford, and in 1557 was translated to the see of Winchester, which, on account of his predilection for his native county, appears to have been the object of his wishes. This dignity, however, was granted him upon condition of his paying 1000l. yearly, out of the revenue of his see, to cardinal Pole, who complained that the temporalities of Canterbury (of which he was then archbishop) were so ruined by his predecessor, that he could not live in a manner suitable to his rank. On the accession of queen Elizabeth, bishop W T hite was deprived of his dignity, generally because he retained his attachment to the popish religion, but more particularly for his open contempt of the queen and the queen’s authority, on two remarkable occasions. The first was, when appointed to preach queen Mary’s funeral sermon, or oration. His text was, “Wherefore I praised the dead, which are already dead, more than the living which are yet alive,” Eccles. iv. 2. In this sermon, after exhausting his powers of oratory in celebrating his saint of a mistress, whose knees he affirmed were hard with kneeling, he burst into a flood of tears Then, recovering himself, he said, “She has left a sister to succeed her, a lady of great worth also, whom we are now bound to obey, for melior est canis vivus leone mortuo (better is a live dog than a dead lion), and I hope so shall reign well and prosperously over us, but I must still say with my text, laudavi mortuos magis quam viventes (I praised the dead more than the living), for certain it is Maria optimam partem elegit (Mary hath chosen tfce better part).” It is easy to suppose that queen Elizabeth would | not be much pleased with these complimentary innuendos. The other offence was of a more serious nature, for at the public disputation in Westminster Abbey, with some of the reformers in 1558, he even threatened the queen with excommunication. He was therefore committed to the tower in 1559, after he had appeared in public, though deprived, in his pontifical vestments. His health afterwards declining, he was released, and permitted to retire to his sister’s house at South Warnborough, where he died Jan. 11, 1560, and was interred, agreeably to his will, in Winchester cathedral. Tanner. Bale. Pits. —Ath. Ox. vol. I. new edit. —Strype’s Cranmer, p. 233, 320, 371. 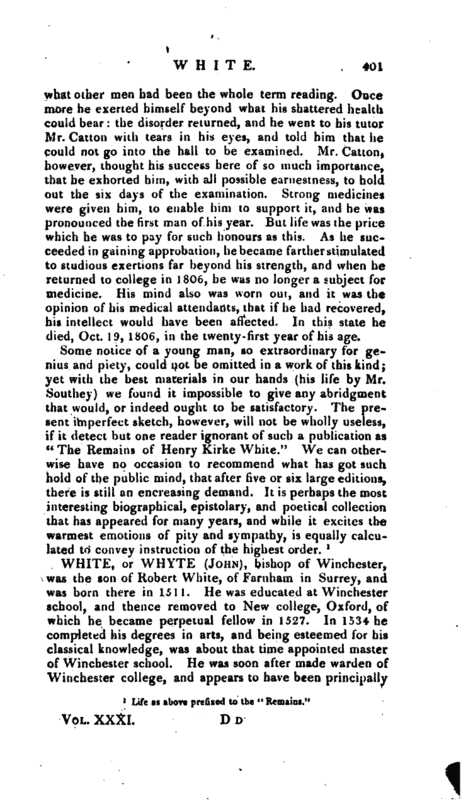 Warton’s Life of Sir Thomas Pope, p. 237. 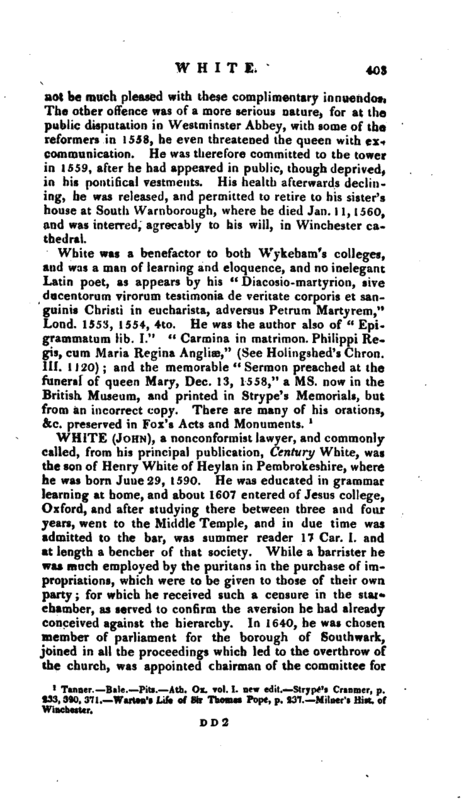 Milner’s Hist, of Winchester.